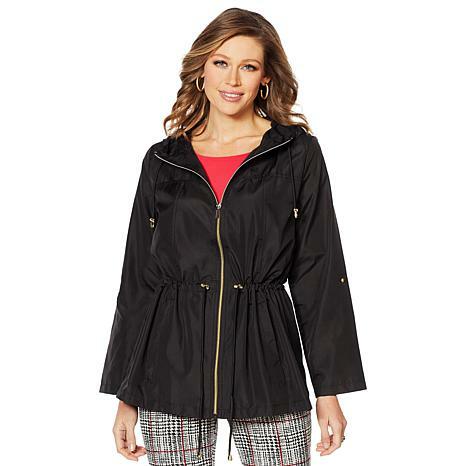 This spring season will bring stormy weather, but you won't get soaked when you sport this jacket. Water-resistant fabric and drawstring details make it custom-fitting so you stay dry and stylish through misty mornings and drenched evenings. Light-weight and sweet. Love the design. It fits perfectly to size with just enough room to wear a sweater under. Will be returning, quality is not something I would wear. 3 stars because its super cute and lightweight. However, I needed it to keep me dry while walking my dog. The fabric absorbs light rain really quickly and then clings to you. Sorry to say that its going back.